Into The Wild, by John Krakauer was a short read, it doesn’t take a lot of room on the shelf, but there are treasures within that belay it’s small size. A friend recommended the book to me about 4 years ago, and gave me a short synopsis of the story. I remember it well, because I had just finished reading: ‘Between A Rock And A Hard Place’ by Aron Ralston, and I was telling him about it. He immediately told me that I would like ‘Into the Wild’. Now, I find it in the used section of a local favorite bookseller.It is not a glorification of a man who failed, it is not overly critical, nor is it unemotional. Rather, it is the oft questioning watcher, written by a man who never met his subject, but who somehow connects to Christopher McCandless.Told in muse, and memory, by those who knew him, and those who think that they did, stitched together by the ponderings of the author and quotations from Thoreau and others, it brings one down to the place where understanding why a well educated young man would up and abandon every vestige of society and live a vagabond existence in Alaska. Unknown to me at the time of purchase/reading; a movie of the same title had been made. ‘Inspired by the true story’ is the tag line. I watched the movie, and though I enjoyed it, this is not a review of the film, but of the book. The Silver Screen takes liberties with the story-line. Weaving romance through it, as only Hollywood can do. But I hope that the movie doesn’t ruin the story. It is not a grand and great adventure, this is fundamentally a tragedy. This was an intelligent and caring young man, he went into the wilds of Alaska one day, and simply never came back. I would have liked to meet Chris, I think he would have been interesting conversation, and though we would disagree about a great many things, I think in the end we would have been friends. I too feel the wanderlust urge from time to time, but like most, I seldom really venture far from the world. I keep close to electricity and internal combustion engines. Some days I wonder what kind of changes an adventure like the 2 year tramp that McCandless embarked on would yield in my life. I am far too comfortable in my 21st century existence. In that thought; I give a hearty hey-ho to Chris’s ideals and adventuresome spirit. 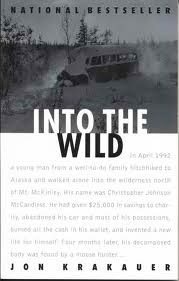 Read the book, and failing that: watch the movie, then read the book.The debate that raged over McCandless demise is secondary to the passions that drove him, and the side story of his impact upon those he came into contact with along the way.